In recent weeks we have seen many news reports and heard plenty of chatter on social media about the looming cuts to penalty rates for retail, hospitality fast food & pharmacy workers. There’s been plenty of hear-say and conjecture without many actual facts seeing the light of day. Nor is it made clear to us what the real agenda behind the move actually is. The other important thing to remember is that the big players like your Coles, Woolworths, Kmart, Target, Bunnings, etc… are on enterprise bargaining agreements with their employees. This means they don’t pay the minimum award wage in most cases. Many other employers do the same. Some may even be on a salary agreement. It’s this award wage that is seeing the cut to weekend and public holiday rates. So check with your employer if you’re unaware what you’re on. If enterprise agreements come to an end, which some do have an expiration date before the unions go back into negotiations, the large retailers may be tempted to simply go on the award rates but that would cause their Monday to Friday and Sunday workers to receive lower base pay while lifting the pay of Saturday workers. If everyone is on award rates it would also mean a lot less workers would join the union and ALP funds would be reduced. It’s yet another game of political chess and as per usual we’re the pawns. Undoubtedly some people will be affected by the cut. But there will also be cases where these cuts can benefit small businesses and the economy. The old ‘Trickle down economics’ is what it’s called. Like i said, this isn’t an ideal situation for everyone. But perhaps if you’re stuck in a part-time or full-time hospitality or retail job that isn’t on an enterprise bargaining agreement, and you rely heavily on Sunday rates, you may need to approach your employer to talk about your situation and what may be best for you moving forward under the proposed changes. All of this aside the real question is why? 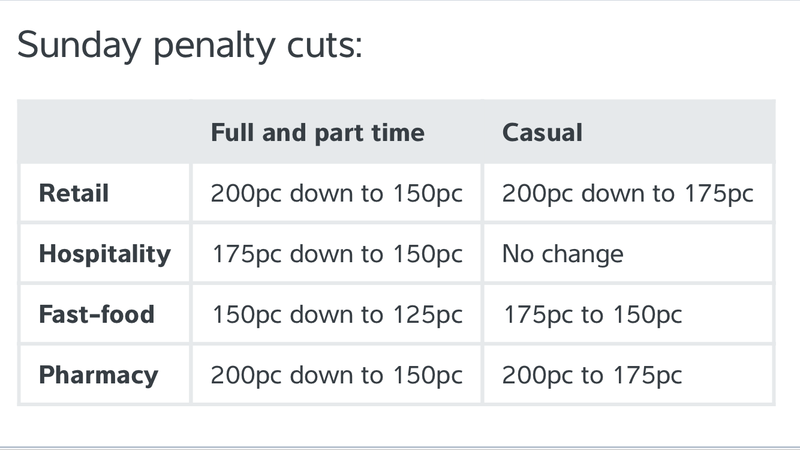 Why reduce the penalty rates for what is a huge part of our economy? Why make it more attractive to be on a casual wage rather than a secure full-time job with the benefits that come along with it. It’s no secret we are quickly becoming a service economy like the USA. The divide over there between the haves and have-nots is becoming wider and wider. The destruction of the middle class is becoming more and more evident. Even the McKell Institute, a “not-for-profit” think tank that tries to shape policy for governments, agrees with this scenario. That’s not all that’s growing rapidly. Personal debts are skyrocketing and families are finding it harder and harder to make ends meet let alone save a buck. This is evident via the many payday lending companies that have started up like Wallet Wizard or Nimble. Offering easy money at extreme interest rates if not paid off in time. With the cost of living going up faster than inflation the wage earnings of workers isn’t keeping pace. Another clear sign of the increasing attack on the middle class. With the middle class out of the way there really will be only rich and poor. No one left to be able to take on the big players and the control grid will be in place.